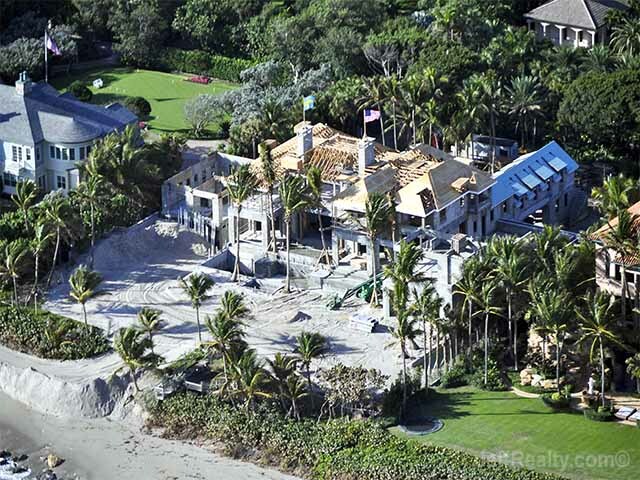 Tiger Woods' ex-wife, Elin Nordegren, may soon be moving into her new post-divorce pad in North Palm Beach, Fla.
From the looks of recent photos provided by real estate agent Jeff Lichtenstein, construction on the 21,000-square-foot beachfront home is nearing completion. Nordegren purchased the home in Feb. 2011. Then, last January, she tore down the 17,000-square-foot home that was on the property because it was cheaper to bulldoze the mansion than to renovate it to meet contemporary hurricane building codes. By May 2012, construction on the new home was reportedly underway. Lichtenstein's photos show Swedish and American flags planted on top of the house -- a clear nod to the former model's Swedish roots. The estate will reportedly boast an Olympic-sized swimming pool, a koi pond, spa and gym to boot. Click through the slideshow below for more on Nordegren's new home and four other celebrities who invested in some pricey real estate post-split.